I’ve never walked east, into the city, from Pense before. It almost makes it into a new walk. I saw new things, or saw things I’d seen before from another perspective. But it’s still the same straight plod across the prairie, whichever way you’re walking. 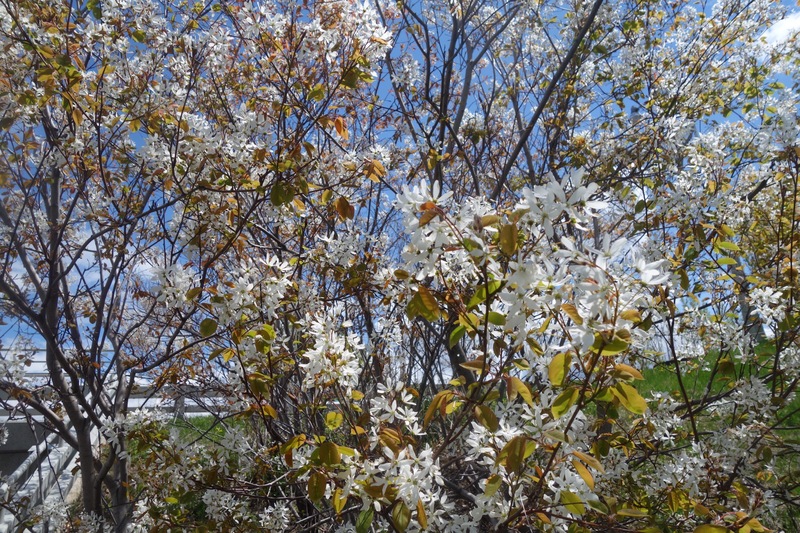 There was a heavy, sweet, funky kind of smell in the air, like chokecherries, but there weren’t any chokecherries around. I wonder if it wasn’t the stink of agricultural chemicals–herbicides and fertilizers. I don’t know. It hung around for hours. Eventually it went away as I got closer to the city. The road was wet in spots–no surprise, given all the rain we’ve had in the past few days–but I was wearing my new gaiters, which are made by a company with the unlikely name “Dirty Girl” (don’t Google that: this is their web site) and they kept the mud and stones out of my boots. I ate an early lunch (or second breakfast), then ate another lunch a few hours later. But most of the time I was striding forward to the east, or at least stumbling in that direction. 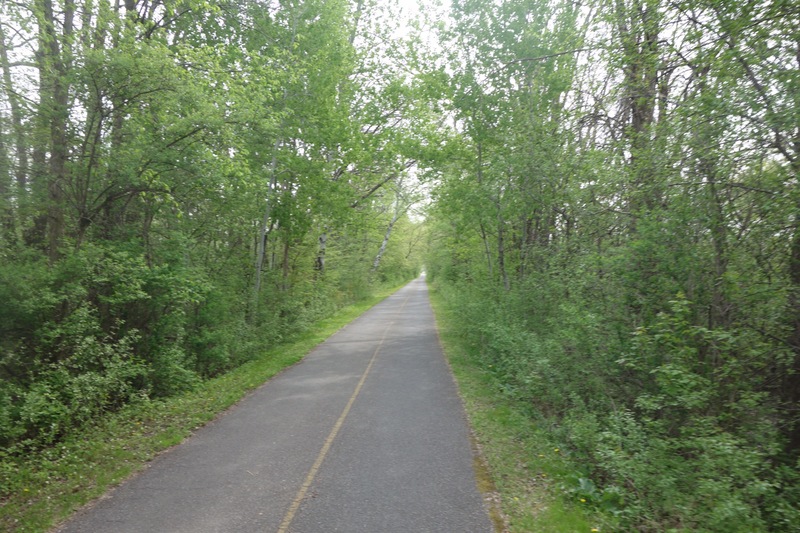 After 20 kilometres or so I reached Pinkie Road and headed north to 13th Avenue, which runs right into my neighbourhood, although from the off-leash park I took the more scenic route along Wascana Creek. After seven hours and 31 kilometres I was home and drinking a well-deserved beer. And no blisters! Maybe my feet are finally toughening up, or maybe wearing a different kind of socks helped. It’s hard to say: I’ll need to go on more walks this week to be sure. After all, I leave for my walk in Ontario in less than two weeks and I want to make sure I’m ready. 1. When I’m in a city with a Mountain Equipment Coop store, I like to take a look around, see what’s new. Shopping online just isn’t the same. Not that I spend much money–I’ve already got all the gear I need and then some–but you never know if something might catch your eye. 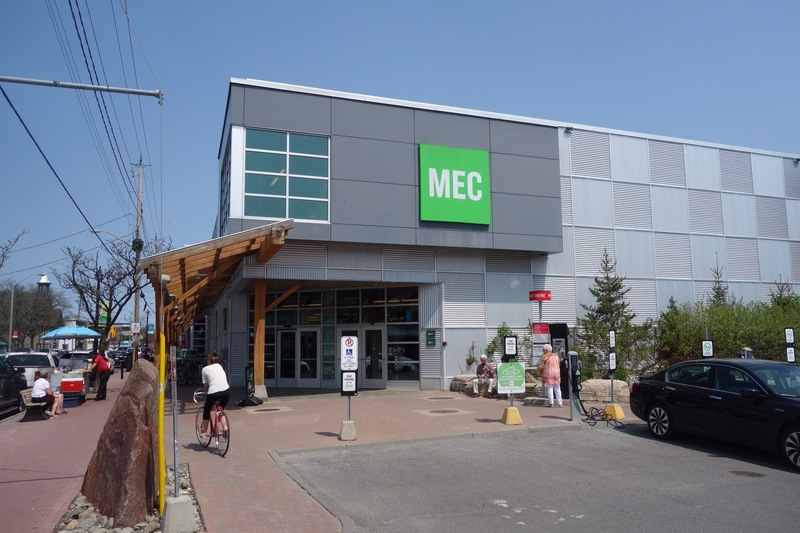 Google Maps told me it was 13 kilometres from Kanata to the MEC store, so I decided to walk there on Friday morning and then take the bus to my sister’s place for the afternoon. The day before, she’d shown me a map of the city’s recreational pathways and I had, or thought I had, a better sense of where I’d gotten off track when I walked to their apartment the day before. 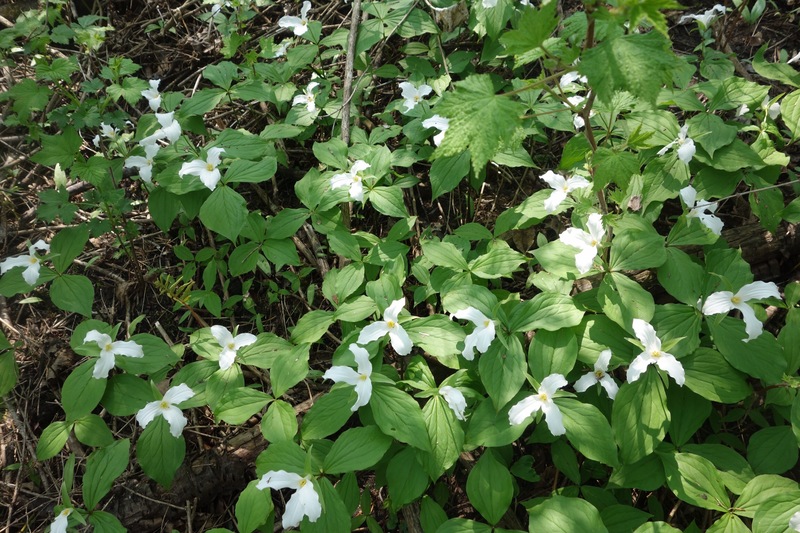 I walked through the Greenbelt along the Watts Creek pathway, past drifts of trilliums and other spring flowers, to Moodie Drive, where the Ottawa River pathway begins. 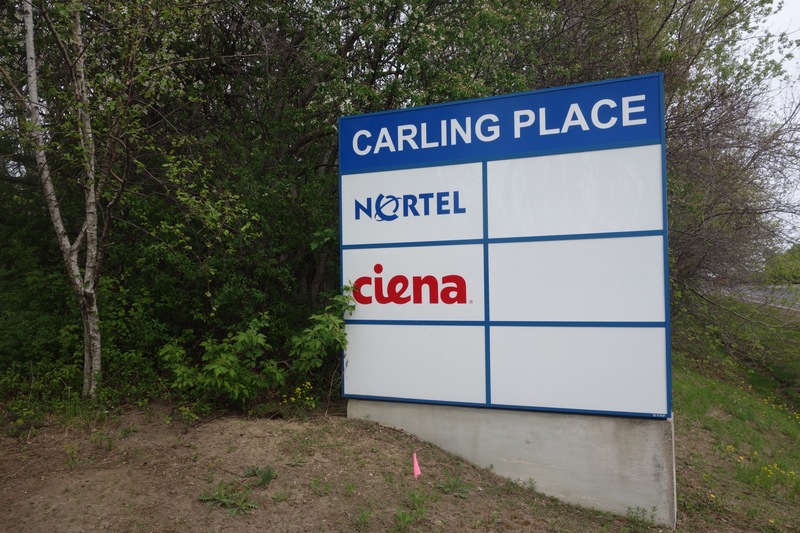 Then I walked up to Carling Avenue, past an old Nortel campus, and followed Carling all the way to Richmond Road. 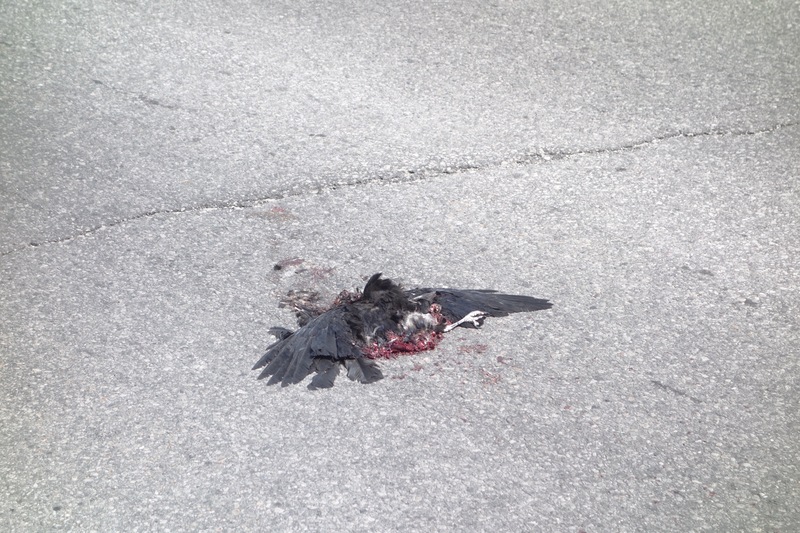 The walk along the sidewalk was long and hot and straight and unrelenting. 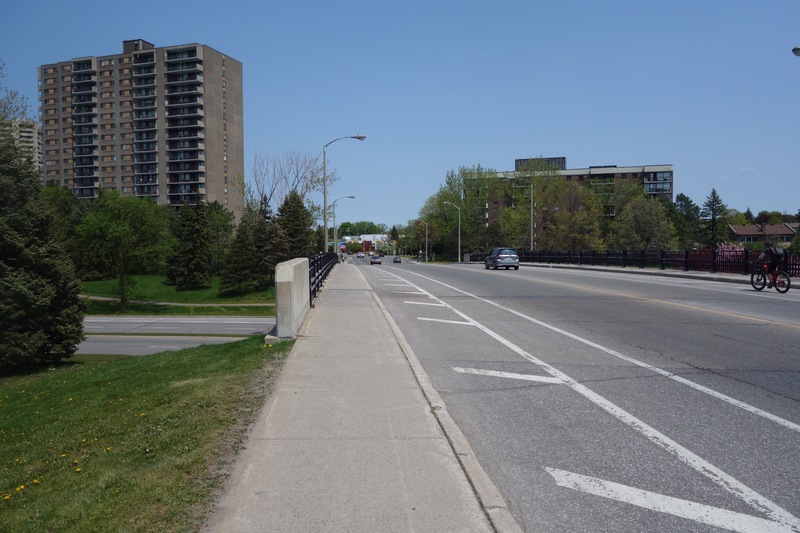 Suburban walking can be difficult; the roads are designed with cars in mind, not pedestrians, and what’s interesting (or at least functional) at 60 kilometres per hour is quite dull at 5 kilometres per hour. Things got a little more interesting when I finally got to Richmond Road, where there are more stores and people to look at. I finally arrived at MEC and checked my GPS. 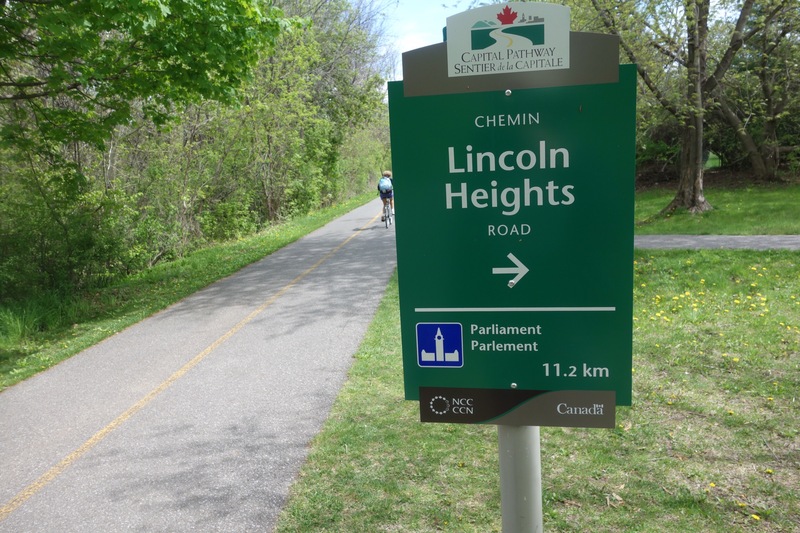 It wasn’t a 13 kilometre walk; it was 19 kilometres. No wonder it’d taken so long. 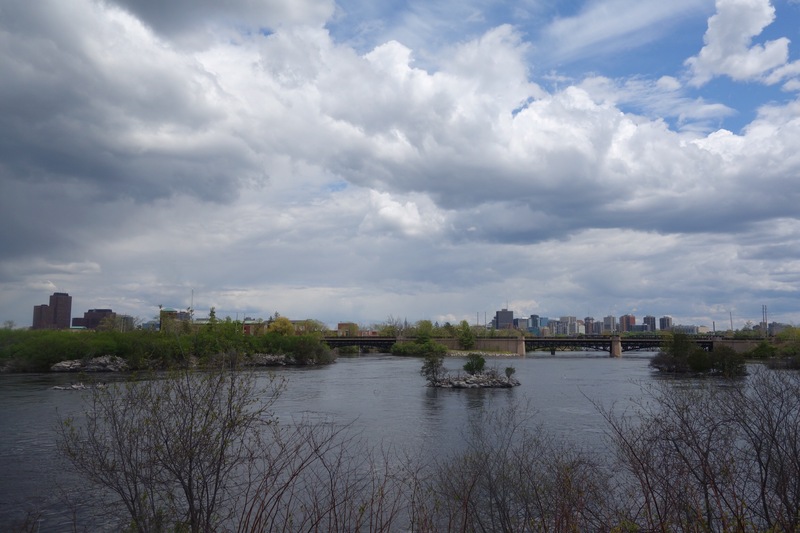 I bought a couple of small things and then caught a bus that took me through neighbourhoods where I’d lived when I was a student–ah, sweet nostalgia!–and transferred to another that took me into Vanier, where Cindy and Drew live. 2. 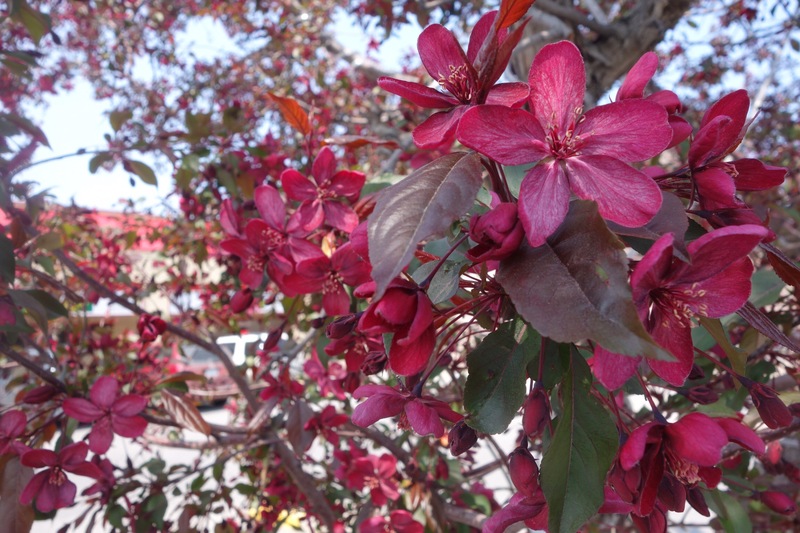 Yesterday I decided to walk to Vanier again. This time, with what I’d learned from experience and maps, I thought I could follow a more direct route, avoiding detours and dead ends. I won’t have to walk as far, I thought. I was wrong. I saved all of half a kilometre. 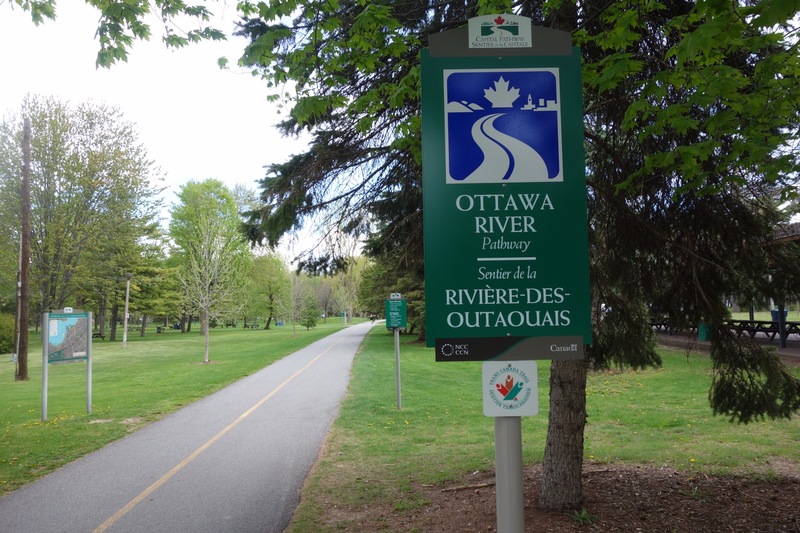 I followed the Watts Creek path to the Ottawa River path, which I took as far as the Portage bridge at Victoria Island. 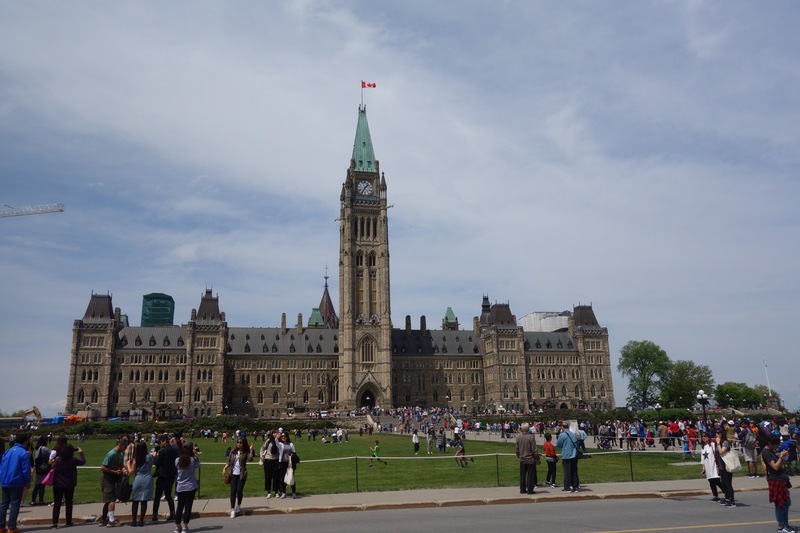 Then I climbed the stairs up onto Wellington Street to see the Parliament Buildings and the tourists. It’s early in the season but the sidewalks were thronged with visitors. These multiuse pathways are complicated. There are so many different kinds of people using them, from pelotons of cyclists dreaming about the Tour de France to mothers trying to get their toddlers to put their shoes back on. I’m surprised there aren’t more collisions. By the railway bridge I saw a polished wooden chair. 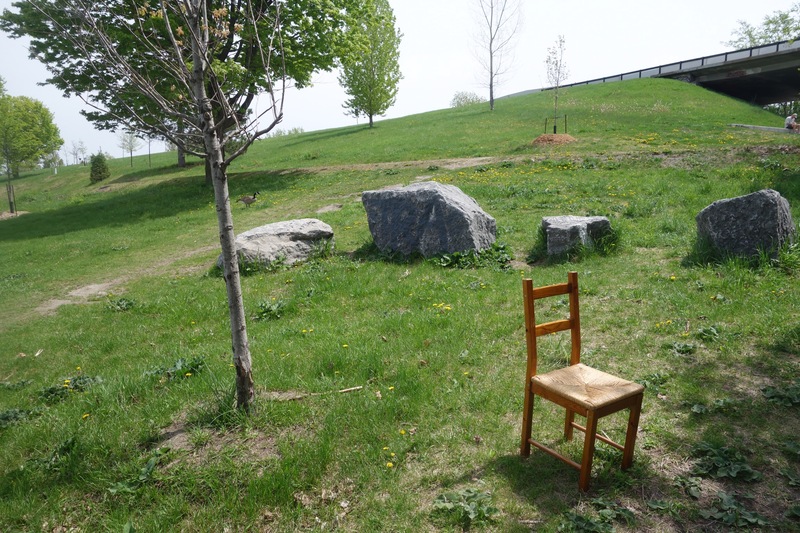 A guerilla art installation? Who knows? 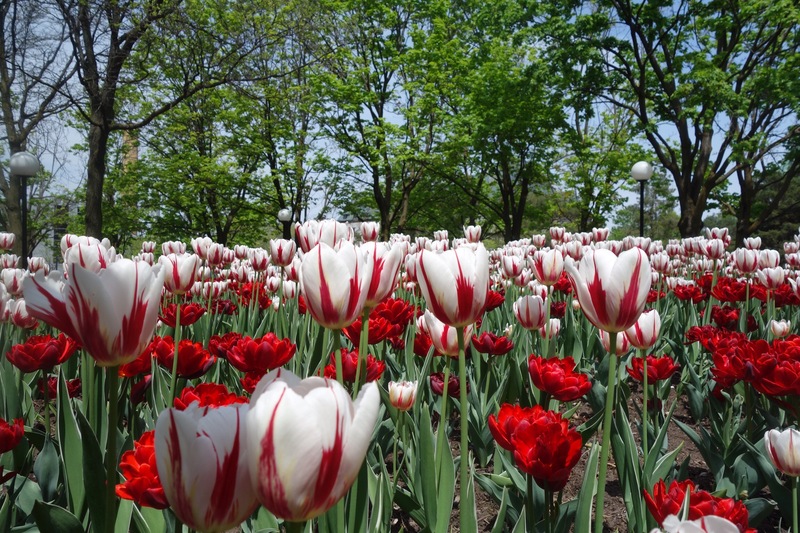 On Wellington, I stopped to take pictures of a bed of tulips in the park where the previous government wanted to put a memorial to victims of Communism. I’m glad that didn’t go ahead: the park is better than the ugly monument they were planning to shoehorn into it. 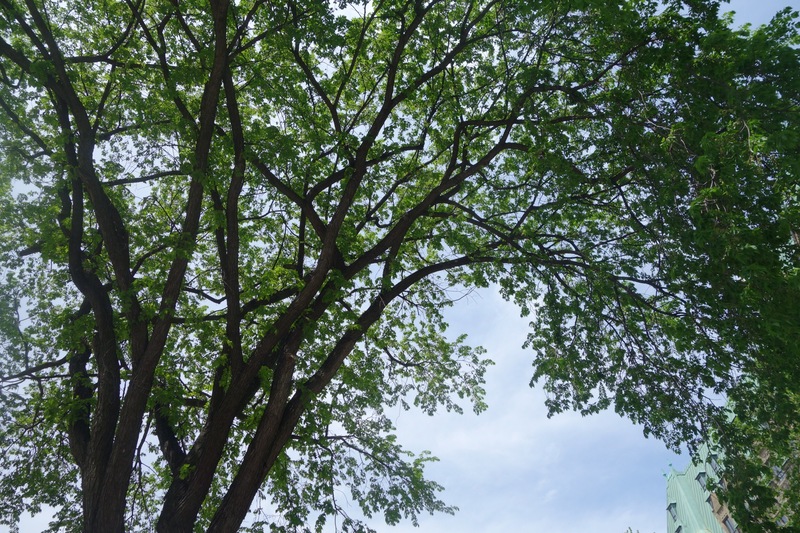 I also took pictures of a stand of elm trees between the Supreme Court and the Finance Department building–trees that somehow escaped the scourge of Dutch Elm Disease. 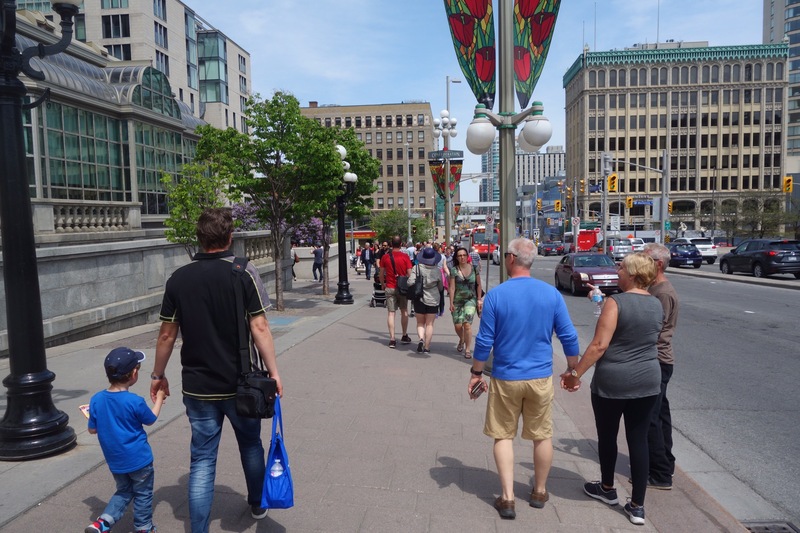 Then Parliament and the tourists and along Rideau Street to Montreal Road. In all, I walked 29 and a half kilometres. That puts my total for the past three days at almost 80. I feel more confident about my upcoming walk, even though I’m still getting blisters. I’ll have to keep working on a solution to that problem. I’m making a quick trip to Ottawa to see my sister. It’s supposed to be a time to spend with family, but I’m all-too-aware of the long walk that’s coming up quickly, and worried that I won’t be ready. So, I could feel myself being pulled in opposite directions. The compromise? 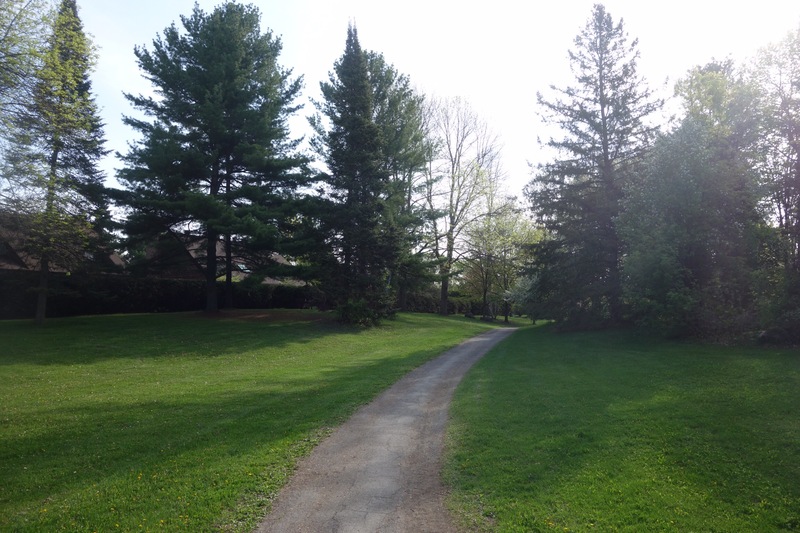 Yesterday I walked from Kanata, where my brother- and sister-in-law live, to my my sister’s and brother-in-law’s apartment in Vanier, where I spent the afternoon and cooked dinner. 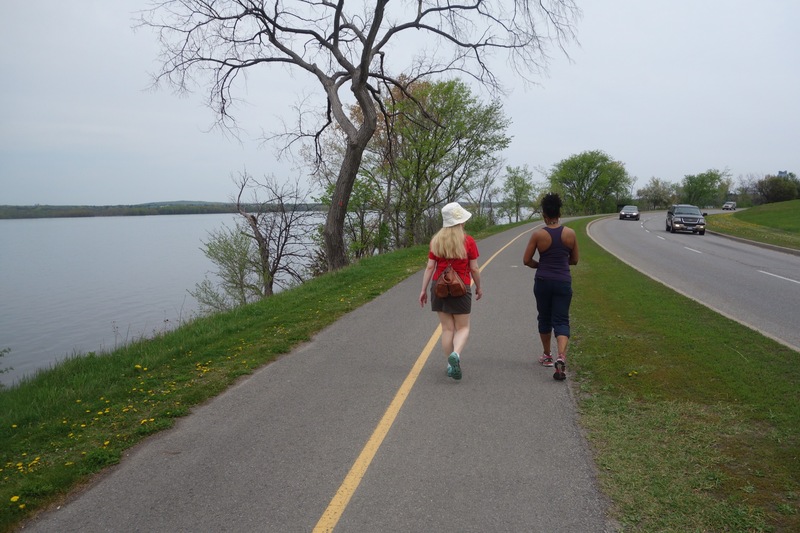 Ottawa is a big place; the walk turned out to be 30 kilometres long. 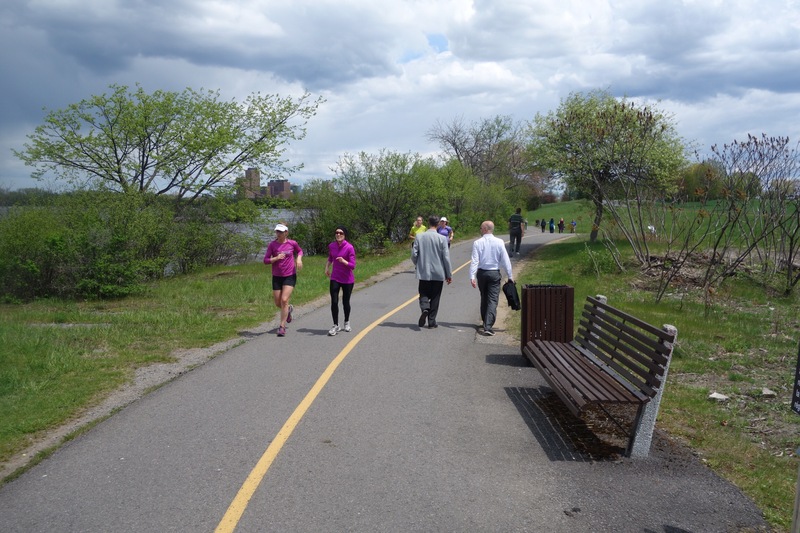 When I lived in Ottawa, I could never have imagined making such a walk or thought it would be possible. Now I know it’s just a question of taking one step at a time in the right direction (more or less) for seven hours. That’s one of the lessons I took away from the Camino de Santiago: small steps can, eventually, lead to achieving bigger goals. 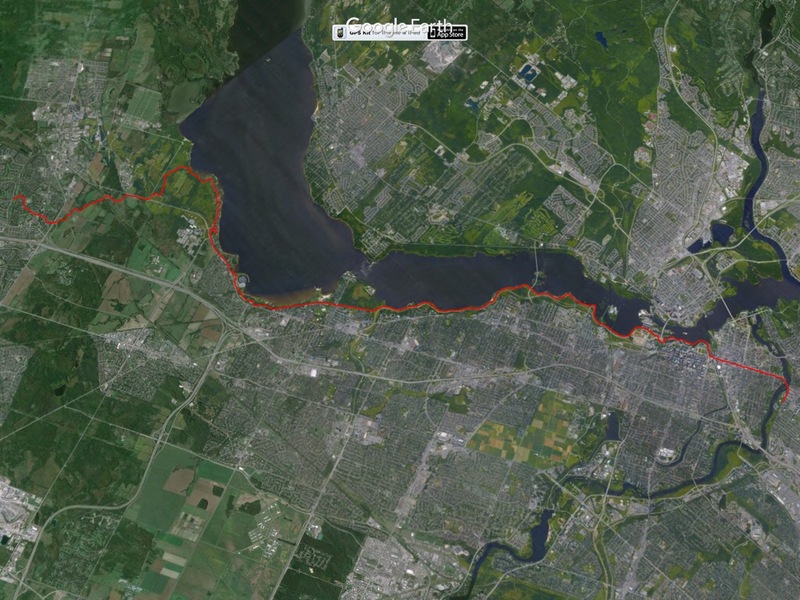 I walked almost the entire way on footpaths, or bicycle paths, through the Greenbelt and then along the Ottawa River. I knew that if I kept the river on my left that I’d be heading in the right direction, so navigation was easy. 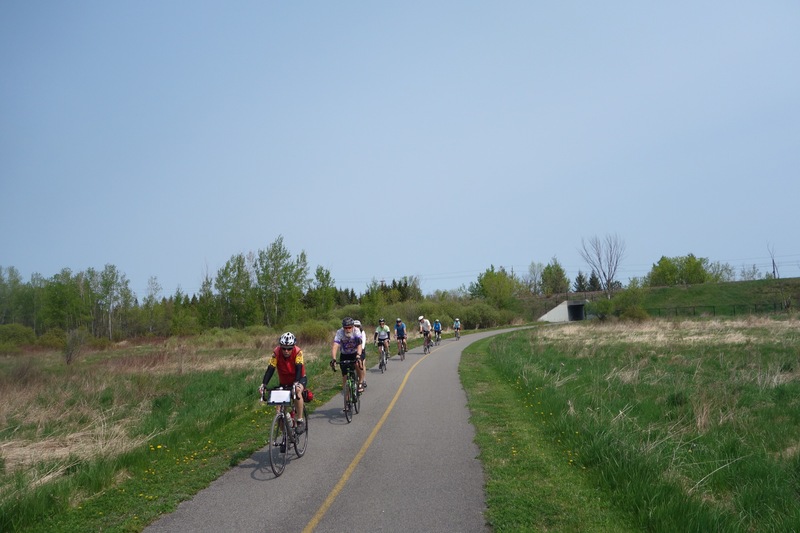 But getting from Kanata to the river was a bit of a challenge, and I ended up taking a detour through a riverside neighbourhood at Shirley’s Bay. 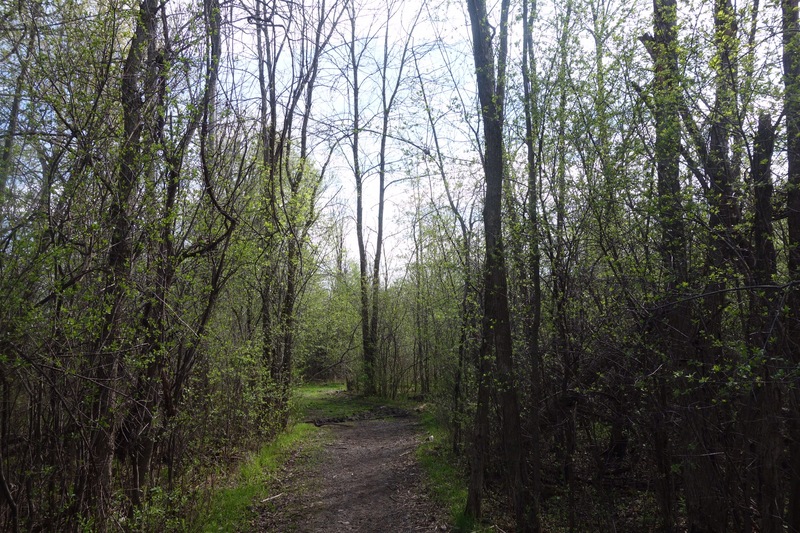 It added several kilometres to the journey, but part of it was a lovely walk through a forest, so I didn’t really mind. Besides, it was early in the day and I was still relatively fresh. 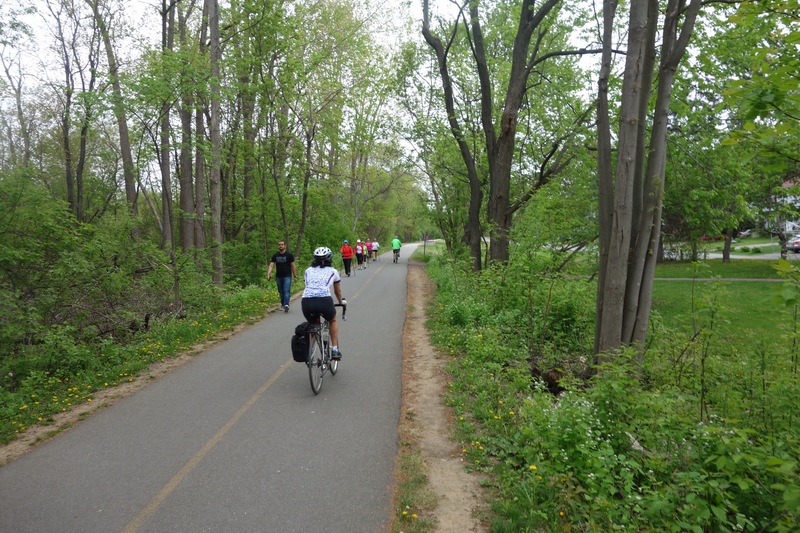 The riverside bicycle path is very different. Like most of the other recreational paths in the city, it’s much more civilized: paved and divided into lanes with a stripe of yellow paint. 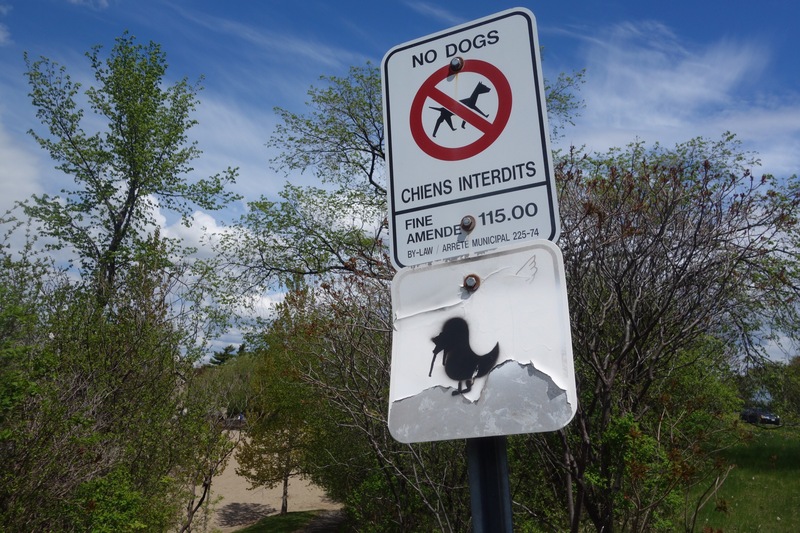 Signs warn you not to feed the birds and to pick up after your dog. Other signs provide what turned out to be inaccurate information (according to my GPS, anyway) about how far it was to the Parliament Buildings. At noon, the path filled with civil servants. At one o’clock, they disappeared. 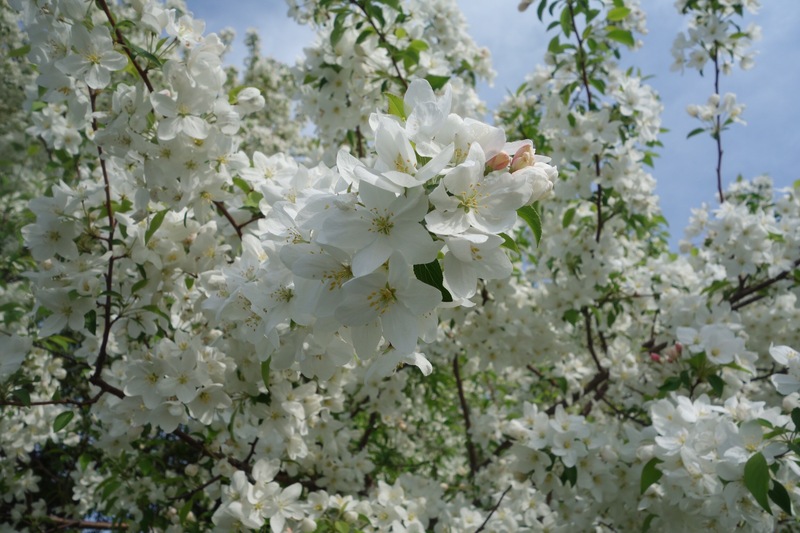 On the plane I read a few chapters from a book someone had recommended called Doing Sensory Ethnography, and I made a point of trying to engage senses other than sight as I walked along: the smell of blossoms or freshly cut grass, the sound of birdsong. I hadn’t brought any food along, and about the time the civil servants went back to work I realized I was hungry; then I wished I could experience the sense of taste. Another hour or two and I was on Rideau Street, where I stopped for a falafel sandwich at my favourite shawarma shop. No photos of the sandwich, though: I was too hungry for such preliminaries. 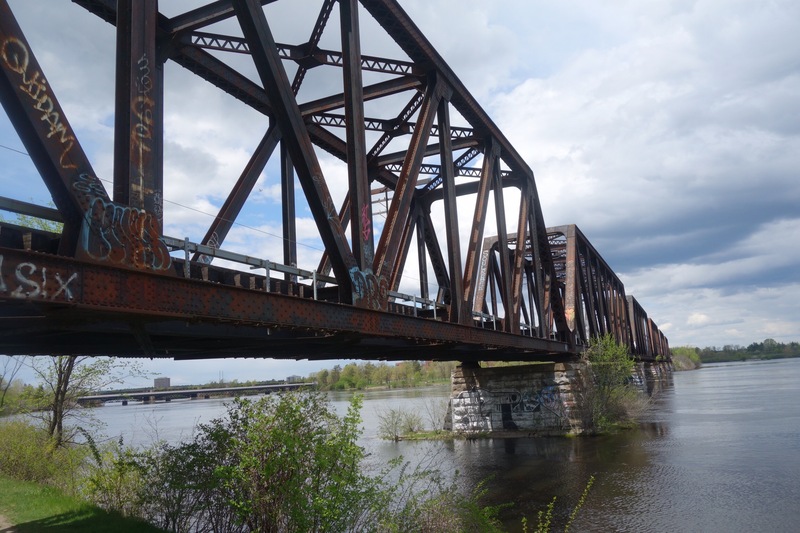 I walked under the old railway bridge to Quebec and then past the controversial Zibi development on the islands next to the Chaudière Falls where the E.B. Eddy match factory used to be. 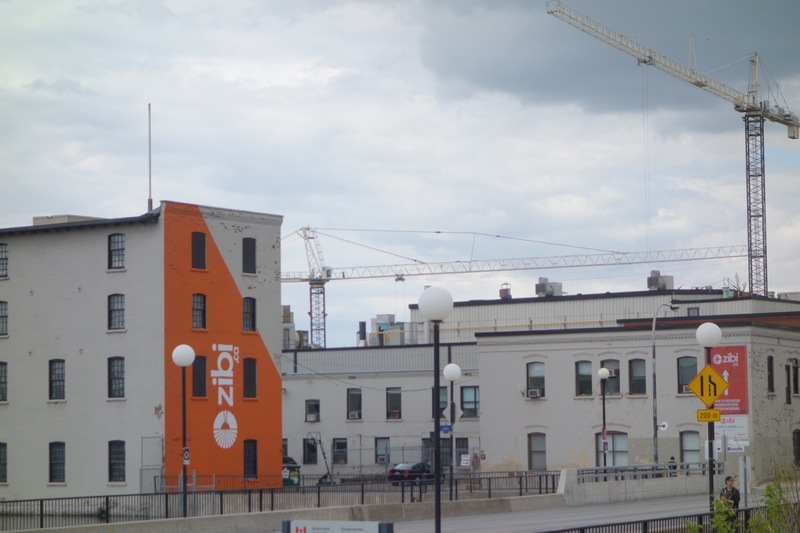 On the one hand, the development is a good use of a derelict industrial site; the first mill was built there in 1806, drawing on the falls for water power, and the island has been home to mills and factories ever since. 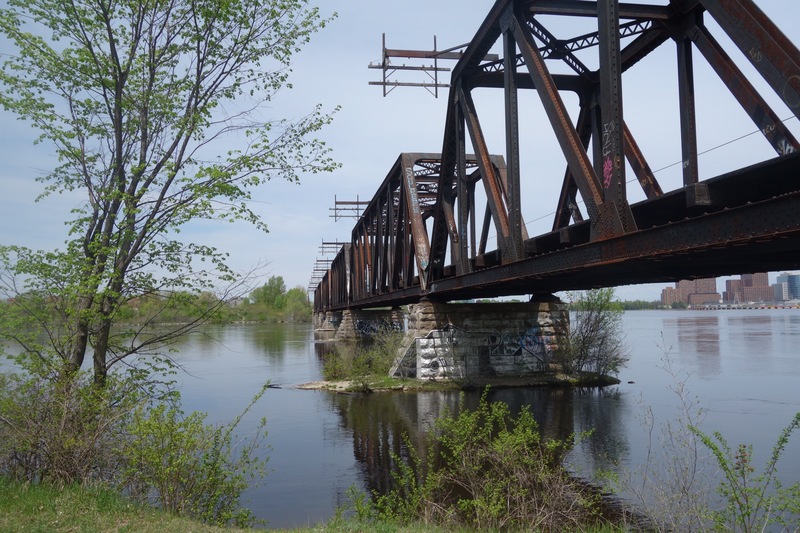 On the other hand, though, the Chaudière Falls are sacred to the Algonquin who used to live in Ottawa (and who have never ceded their title to the land where the city is built through a treaty). The late Algonquin Chief William Commanda wanted to see an indigenous cultural centre built on the islands, but the Harper government let the developer, Windmill, buy the land instead. Windmill has promised to hire indigenous people to build the development and to include street signs in English, French, and Anishnaabe, but some Indigenous people–notably the Métis architect Douglas Cardinal–think that’s just window dressing. Aside from a few “good mornings,” the only people to talk to me were these kids, who wanted to know if I lived around here and teased me about taking their photographs without written permission. I think they were on a school trip. It wasn’t a long conversation–I needed that falafel–and I didn’t stick around long enough to find out what they were up to. 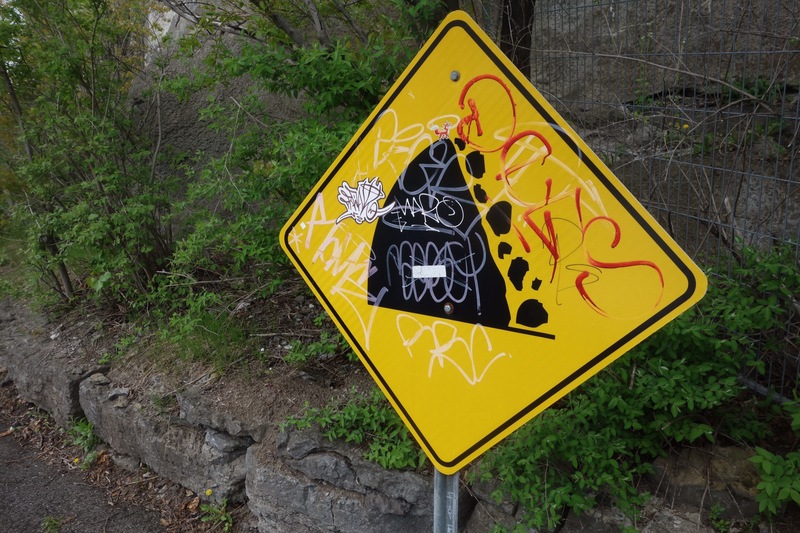 Around behind Parliament Hill (with signs warning of falling rock), up past the Rideau Canal locks, and out onto Rideau Street, thronged with pedestrians (locals and tourists) and with sidewalks closed for the construction of the new LRT line. 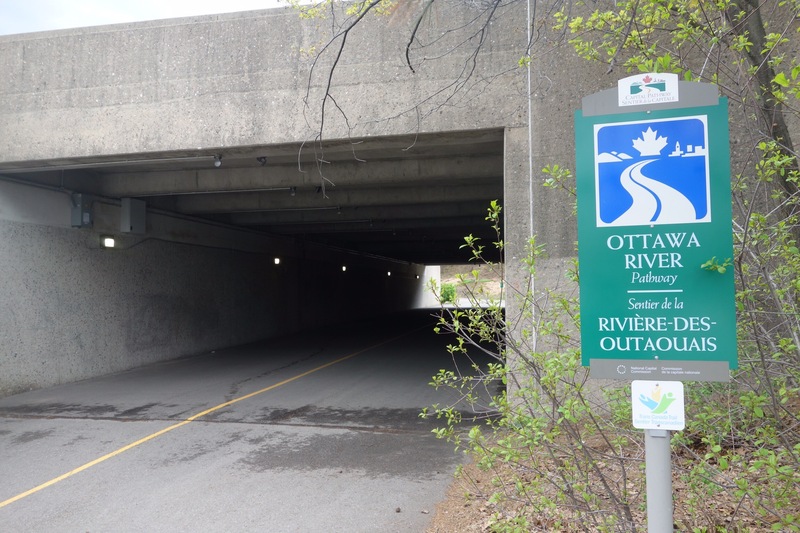 Finally I crossed the Rideau River and arrived at my sister’s place. There, I discovered that I had no new blisters–a huge relief. Maybe my feet are finally toughening up? We had a good visit and I cooked dinner (chicken and asparagus in white wine with pasta). Then Drew, my brother-in-law, gave me a lift back out to Kanata. It only took 20 minutes instead of the seven hours I spent walking that day. But, like Will Self says, walking is a way to resist the mechanical matrix that compresses the time-space continuum. 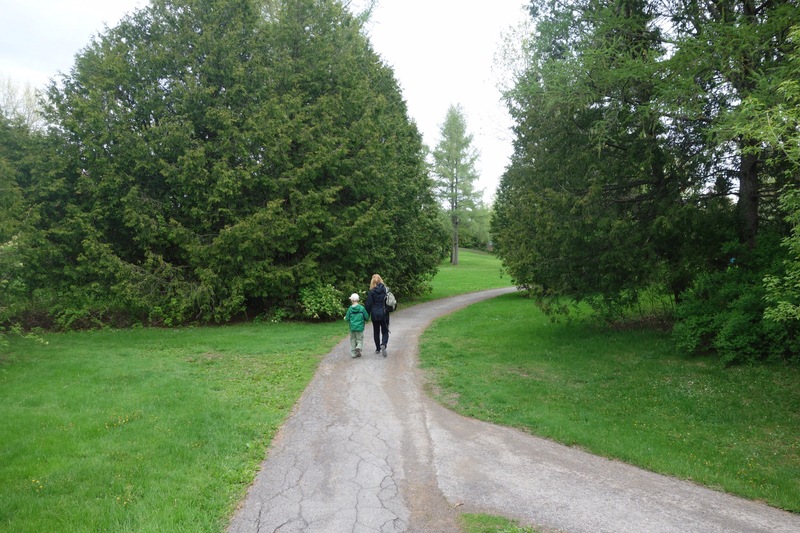 I’m planning another walk today–maybe not as long–and a third for tomorrow. 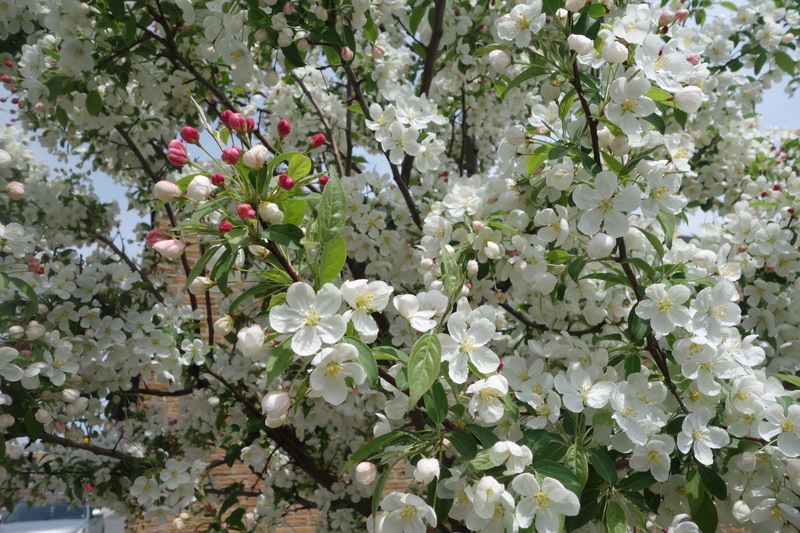 I’m determined to be prepared for my June walk in southwestern Ontario, no matter what. 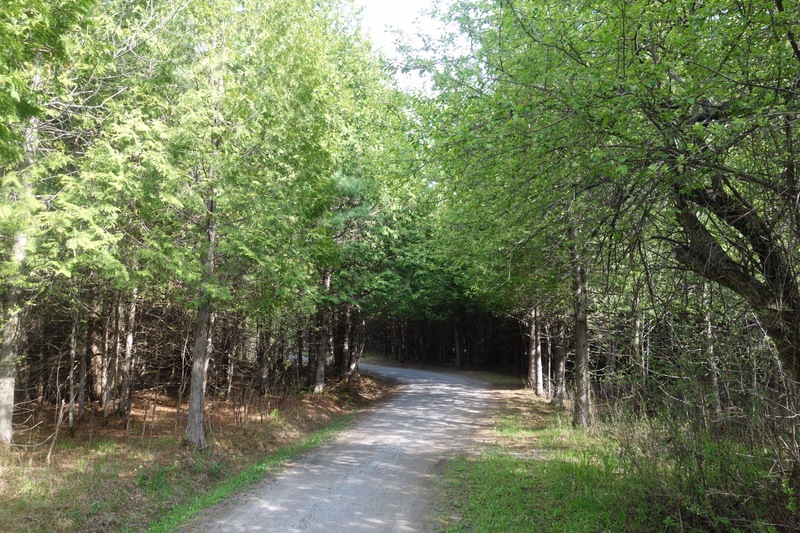 If you’ve been following this blog, check out my new one: Muscle and Bone: Walking the Haldimand Tract. I’m not abandoning this blog, but most of my posts over the next month will be at the new site. This morning, Christine and our house guest, Peter, needed to drive out to the east end to buy coloured markers at the craft store. They were planning to spend the afternoon drawing on 16 mm clear leader. I went along with them and walked back home. It wasn’t a long walk–just 14 kilometres–but it was long enough to see if my broken toe has healed (it’s still quite swollen) and whether I’m still having trouble with blisters. I’ve walked this way before, and I thought the afternoon would hold no surprises, but this time I realized that I could take a footpath to Assiniboine Avenue instead of walking along the sidewalk. A new route: it’s what passes for excitement on these training walks. 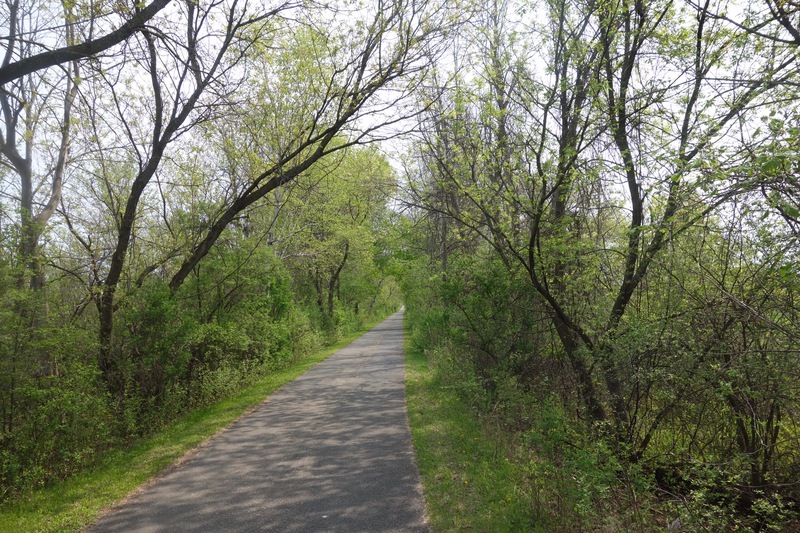 Part of the path wasn’t paved, and it was lined with young (and struggling) burr oak trees. If they survive–and many of them haven’t–it’ll be an interesting place to walk, eventually. 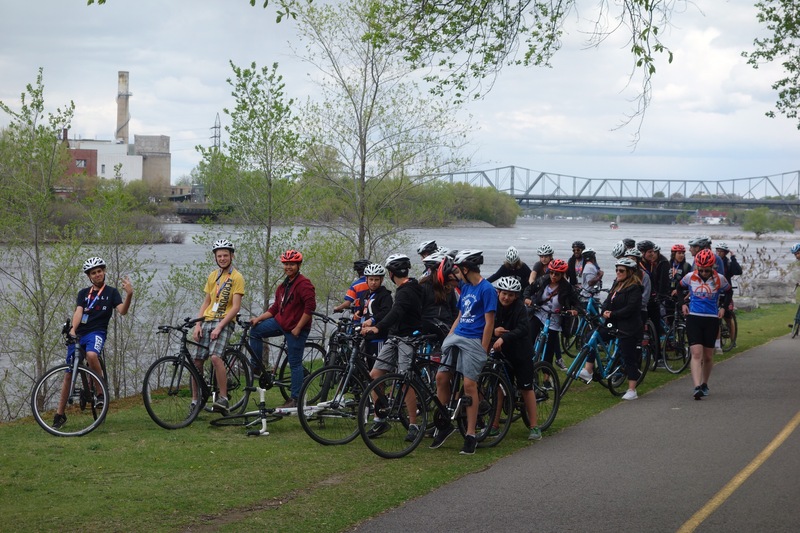 Once I got to Assiniboine Avenue, I was on well-trodden territory: over the bridge across the highway, through the park by the university, under another bridge and along the shore of the lake past the Legislature. The only surprise was the number of goslings I saw; it seems rather early for them, but maybe the warm weather this month has been a factor in the reproductive success of the Canada geese. 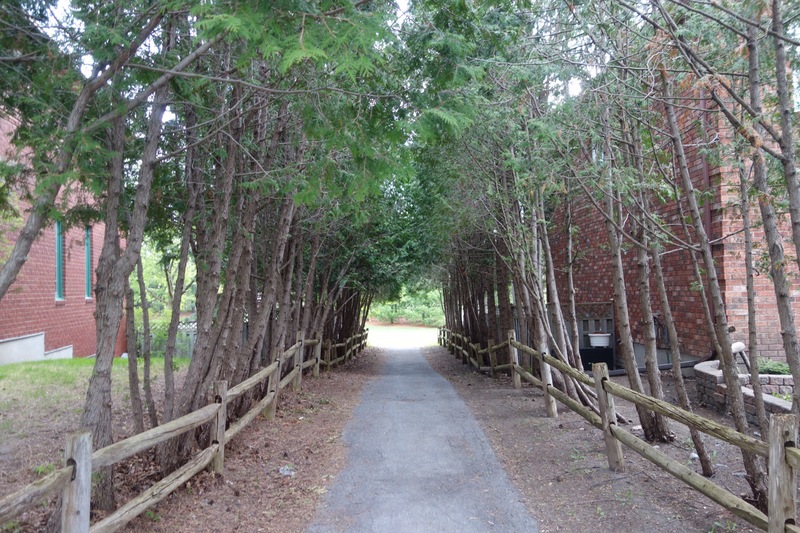 I walked along the creek and over the footbridge–a path I rarely take–and then home. When I got my boots off, I checked my feet and found a new blister. I don’t think it’s serious but it’s still frustrating. And my broken toe hurts less than it did yesterday. I’ll keep taking ibuprofen and hoping that the swelling goes down. Why walk to Pense? It’s not like there’s anything there. Well, that’s not true. One of my colleagues lives there, although I’m not sure exactly where his house is, and there’s a gas station where you can buy a Coke. But here’s the thing: I’m getting tired of walking in loops. I want to walk in a straight line once in a while. And the road to Pense is a straight line, with just one deviation, a dogleg where it crosses the main CPR line. So yesterday morning I set out for Pense. Two years ago I did the same walk, and I thought I knew what to expect. Some of you are wondering where Pense is, or what it is. Pense is a village 30 kilometres west of the city across the flattest part of the Wascana Plains. 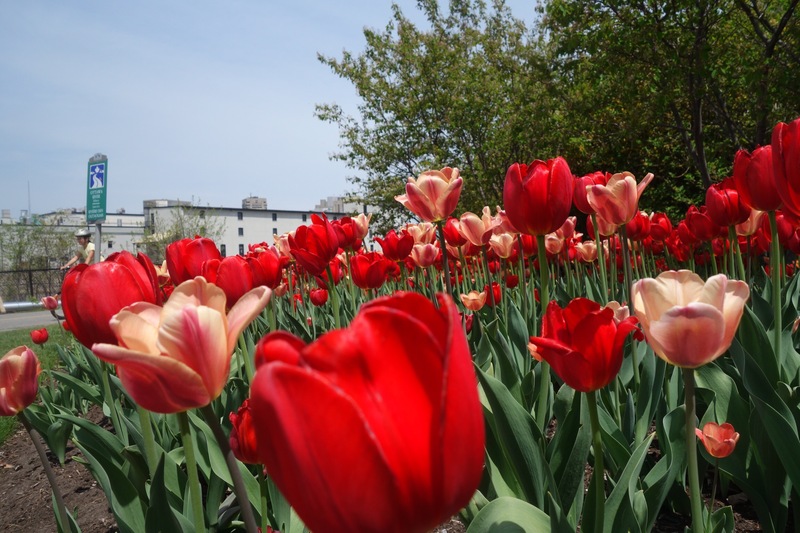 They say it’s a great place to garden because the soil contains something special that makes plants grow. Maybe it’s traces of potash; there’s a big mine just down the road. It was another hot day with a strong southeast wind that flung handfuls of dirt and pebbles at me. The gusts threatened to tear off my hat, despite its chinstrap, so I stopped and shoved it into the outside pocket of my backpack. I was wearing a Buff–a merino wool tube–around my neck to avoid sunburn, and I pulled it up over my head like a snood. So for the rest of the walk I found myself peering through the fluttering curtains of my makeshift niqab. I strode across the prairie like Lawrence of Arabia in shorts, my knees burning red despite liberal applications of sunscreen. The heat and the wind wore me out. So did the blisters on the soles of my feet. They look like doughnuts now: an old blister in the middle, a fresh one around the outside. I started to feel nauseated from heat exhaustion even though I was drinking water and an electrolyte mixture. I was pretty well done in when Christine picked me up just north of the village. So I didn’t quite reach my goal. I really ought to try again another day, to make it all the way to the gas station and the cold Coke that’s waiting there, but it’s a hard walk, mentally: a long, straight, dull plod due west. Still, I hate to leave these things undone. The most important thing I took away from yesterday’s walk is the need to do something to prevent those blisters. Nothing I’ve tried so far has worked: it’s time to come up with something new.